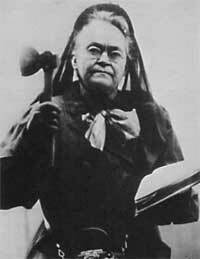 Today is the birthday of intemperate temperance advocate Carrie Nation (1846-1911). The latest gathering of the Ontario Temperance Federation, which coincided with the lifting of the liquor ration, included an abortive proposal to form a temperance party. It is with genuine concern that one sees the public utterances of Protestant churches increasingly identified with the impression that their churches regard the “liquor traffic” as of far greater importance than any theological doctrine, any other social question, or any other moral weakness. We say weakness, for the refusal to make any moral distinction between drinking and drunkenness constitutes a grave social problem; but unfortunately the effect of losing all sense of proportion about it is to make it seem almost trivial. And it can hardly be denied either that many clergymen have completely lost their sense of proportion about drinking, and have transformed a real issue into a superstitious taboo which is injurious to religion (it has, for example, alienated a large number from the churches whose support could have been had for the asking), which has no intelligible relationship to politics, and which is steadily losing all connection with doing good. This entry was posted in Anniversaries, Religion, Society on November 25, 2010 by Michael Happy.